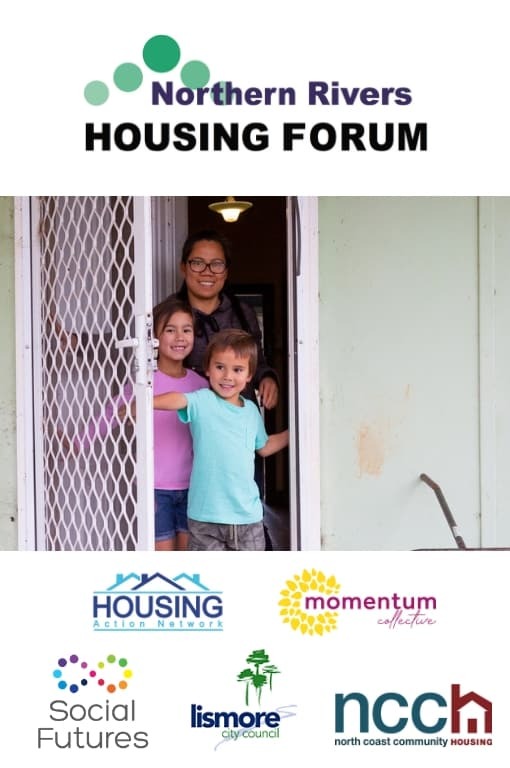 2018 Housing Forum: What’s it going to take? 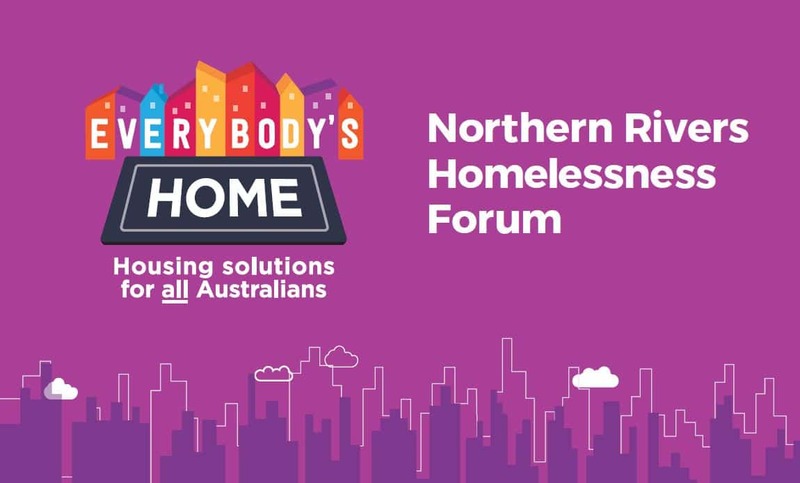 On Thursday 11 October more than 100 professionals and community members gatehred at the Lennox Head Cultural and Community Centre for the 2018 Northern Rivers Housing Forum. 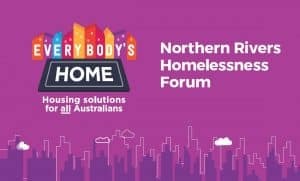 Despite its reputation as a ‘land of milk and honey’, the Northern Rivers region of NSW is facing significant challenges in terms of housing affordability and homelessness. These challenges significantly affect the local community, particularly those on welfare, disability support pensions, and those earning low-to-medium incomes. A combination of high rents and a critical shortage of available rental accommodation has created severe housing stress among a significant portion of the community and forced a significant number into temporary or permanent homelessness. There is an urgent need for policy responses to address this, particularly to increase the amount of genuinely affordable housing. 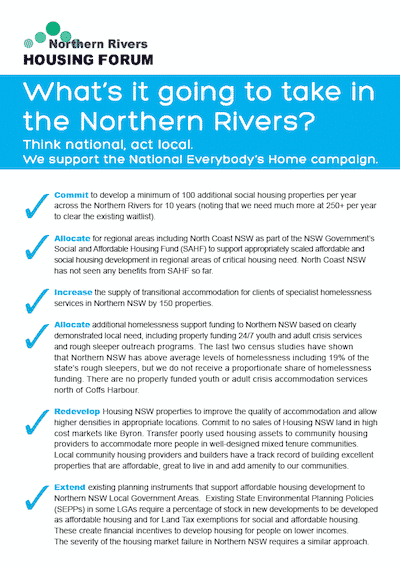 As the national Everybody’s Home campaign says, it’s time to Think national, act local! 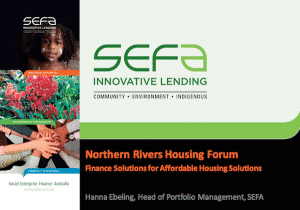 Social Futures is the main contact point for the Northern Rivers Housing Forum, a group of organisations and concerned individuals that identifies and highlights housing issues, needs and challenges and works towards innovative and sustainable approaches to address them. Following 20 years in investment banking in London and Sydney Tony joined Sydney University in 2005. His review on approaches to building the capacity of the community housing sectors in Australia, Britain and the United States became his PhD thesis in 2009, following which he worked for Elton Consulting in 2010. 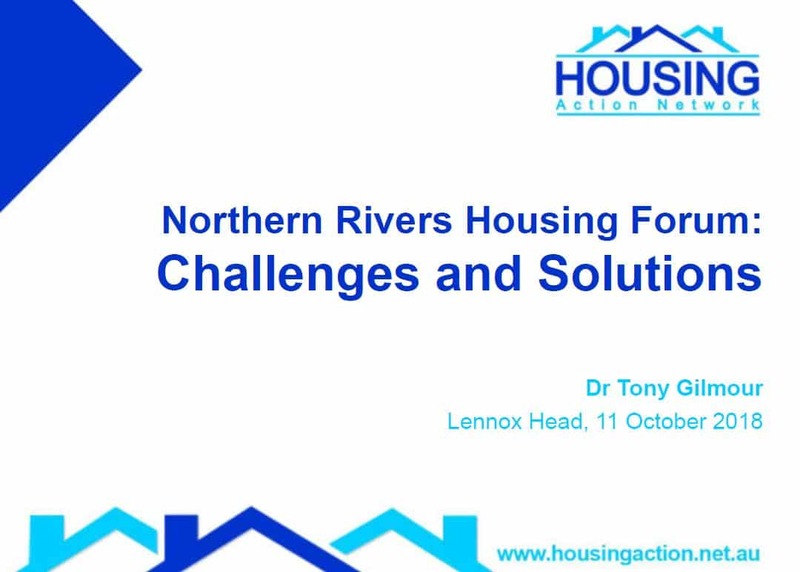 Since establishing the Housing Action Network in 2012, Tony has built it into the leading practice for community housing consultancy services in Australia and New Zealand; supporting housing providers on tenders, strategy, board facilitation and lobbying. Tony holds a BA and MA from the Cambridge University, an MBA from the University of Manchester and an MA and PhD from Sydney University 2009. He is a Certified Housing Professional, former President of the Australasian Housing Institute and a graduate of the Australian Institute of Company Directors. 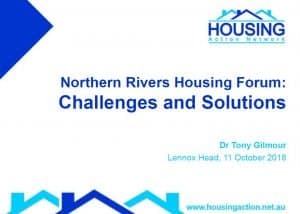 In addition to his research, Tony has published a number of books, including Sustaining heritage: giving the past a future (2007); Navigating change: a history of Compass Housing (2015); and Champions of change: Shelter NSW, community activism and transforming NSW’s housing system (2018, forthcoming). He also co-authored After council housing: Britain’s new social landlords (2010) with Hal Pawson and David Mullins. 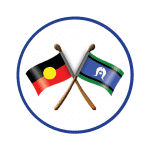 Kate Colvin is the spokesperson for Regional Communities in the national campaign Everybody’s Home and the Deputy CEO and Manager of Policy and Communications at the Council to Homeless Persons, Victoria’s peak body for homelessness. Kate has been working in housing policy for a number of year and played a key role in Australians For Affordable Housing and other Victorian housing-related campaigns. As the former CEO of the peak body Youth Advisory Council of Victoria (YACVIC) Kate also led successful campaigns on transport and youth justice. 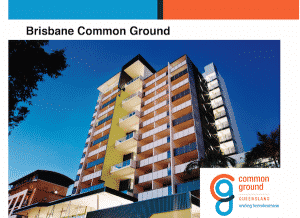 Sonya is the inaugural Chief Executive Officer of Common Ground Queensland (CGQ), leading the team to successfully implement and deliver Queensland’s first ‘supportive housing’ initiative; Brisbane Common Ground. Using her not-for-profit and private sector experience, Sonya has acheived the strategic objectives of this landmark project, and to maintain the commitment and support of a broad range of stakeholders. Prior to current role, Sonya worked for 12 years with the Queensland Division of the Australian Red Cross. Sonya passionately believes in creating communities that accept, include and enable all members to lead fulfilled lives. Her mission is to guarantee access to the fundamental human need of a safe place to call home. Hanna is Head of Portfolio Management, Social Enterprise Finance Australia where she has been in the investment team for the past four years. After six years at HSBC bank in traditional finance roles, Hanna was looking for a career move and spent two years in the Philippines where she ran an early-stage social enterprise accelerator program for LGT Venture Philanthropy and worked on a business plan for affordable bamboo housing with United Nations and the Hilti Foundation. 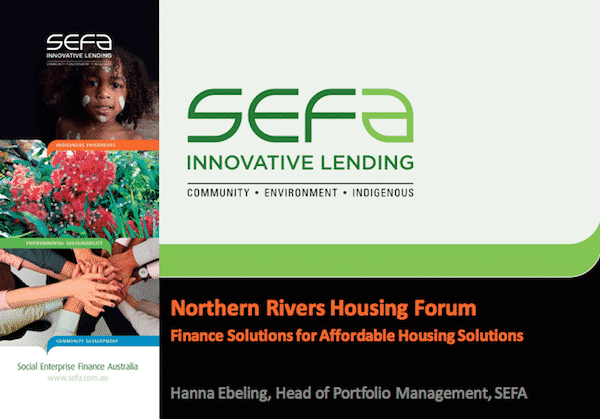 Hanna is passionate about innovative housing models such as Nightingale Housing (urban communities in Melbourne) and tailoring capital solutions for mission-driven organisations, including working with philanthropy on blended solutions.